PVC Spray Hose is also called spray hose, high pressure spray hose, agricultural spray hose, agricultural chemical hose, sprayer hose, herbicides spray hose, pesticides spray hose, gas hose, LPG hose etc. Which is an ideal hose designed for high pressure spray or transfer of various fluids. 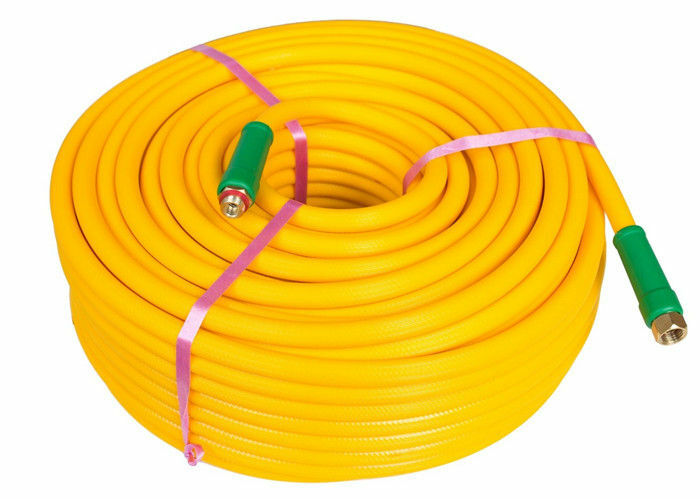 Excellent quality spray hoses made with premium quality PVC compounds, ideally-suited for lawn and ornamental spray applications using wettable powder chemicals. chemical resistance of quality PVC for the transfer or spraying of "wettable powder" type chemicals, mainly used for lawn spraying, agricultural spraying, vineyard spraying, nursery spraying, building washdown. 1. Widely used for high pressure transfer of air, gas, water, herbicides, pesticides, insecticides, fertilizers and other light chemicals for spray pumps, sprayer systems, garden equipment, golf courses, contractors, greenhouses compressed air and water systems and other spraying systems. 2. The hose is widely used in high pressure industrial, compressors, service station and pneumatic tools. 3. Widely used as the accessory in agriculture irrigation and industries, especially suitable for conveying liquid materials at high Working pressure under low or medium temperature, such as delivery pesticide, fungicide, fertilize solution also containing mineral oils for agriculture spraying. 2. Being made of tough PVC materials and high tensile polyester reinforcement, this kind of hose has the advantage of anti-stretch, anti-fracture, resisted high pressure and small expansion rate. 4. It has the good weather resistance and suitable for conveying liquids. 5. Good flexibility and adaptability against climate. 6. No odor, no toxic, environmental protection products. 7. can be supplied with crimped couplings and various lengths available. 1. available with various colors and sizes. 2. achieving both flexibility and high pressure resistance, light weight, the weight is 30% lighter than normal rubber hose. 3. proving long life through excellent adhesive strength between inner and outer tube. 4. no tearing off by excessive pressure and stretch. 5. maintaining the flexibility while pressurized due to less elongation. 6. bonding inner and outer tube directly without adhesive chemical.